Carabiner key chains are among the least expensive advertising tool available and give you a big return on your marketing dollars... People love them! And that's what makes a great promotional product! 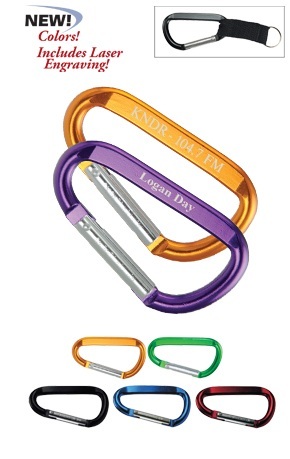 Carabiner clips are handy little devices that make great promotional giveaways. 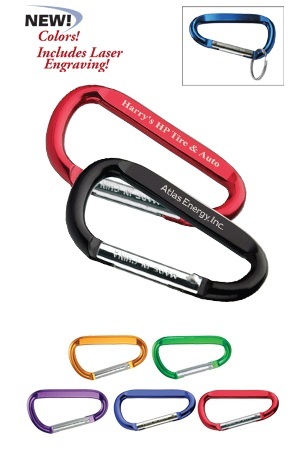 Instead of handing out a business card at your next corporate event, why not hand out useful carabiners instead. Recipients can use them to attach divot repair tools to their golf bag; flashlights or keys to their purse or belt loop. They come in handy sizes that are easy to carry in a pocket or purse, but large enough to display your company name or logo!